South Carolina Governor Nikki Haley, nominated to be the new US ambassador to the UN, told the Senate she would “always stand by Israel” and took a hard line on Russia, clashing with positions taken by President-elect Donald Trump. Haley’s opening remarks at her confirmation hearing before the Senate Foreign Relations Committee revolved around the recently adopted UN Security Council Resolution 2334 condemning Israeli settlements, which she blamed on the Obama administration’s decision to forego the US veto. 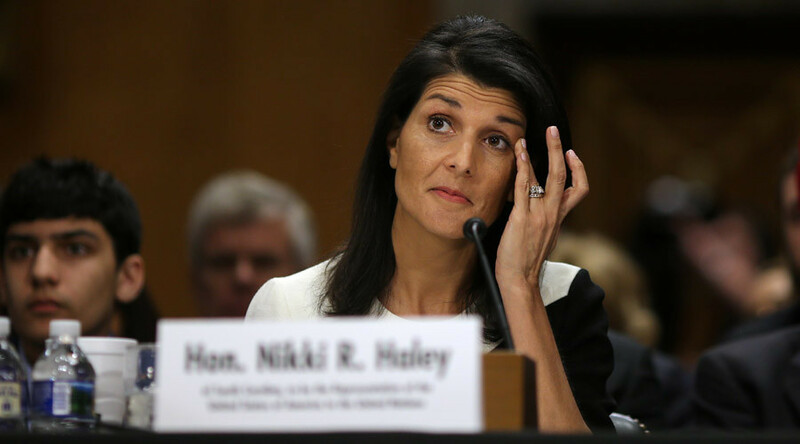 “I will never abstain when the United Nations takes any action that comes in direct conflict with the interests and values of the United States,” Haley told the lawmakers. Admitting a lack of experience in foreign policy, the US-born daughter of Punjabi Sikh immigrants – seated behind her, along with the rest of her family, in-laws and friends – Haley argued she could bring a fresh outlook to the UN. She also reassured the foreign policy establishment rattled by Trump’s election that she agreed with many of their cherished causes. “I will be a strong voice for American principles and American interests, even if that is not what other UN representatives want to hear. The time has come for American strength once again,” the governor said. Haley reassured Senator Jeanne Shaheen (D-New Hampshire) that she would try to persuade the president about the importance of the UN and change his mind on issues such as NATO, “an alliance that matters.” She agreed with Sen. Todd Young (R-Indiana) that Russia was complicit in the “genocide” taking place in Syria, for which the Republican senator blamed President Bashar Assad. On the subject of Russia, Haley agreed with Sen. Ben Cardin (D-Maryland) that Crimea is part of Ukraine. The peninsula overwhelmingly voted to join Russia after the February 2014 coup in Kiev. Trump’s announcement that he would nominate Haley to replace Samantha Power as the US envoy to the UN came as a surprise, because the governor was very much a part of the Republican establishment that opposed him during the primary campaign. When Trump accused her of being an embarrassment and “weak” on immigration, Haley fired back with “Bless your heart,” a serious Southern insult. At her confirmation hearing on Wednesday, she was introduced by Sen. Lindsey Graham (R-South Carolina), one of Trump’s most outspoken critics in the Republican Party.